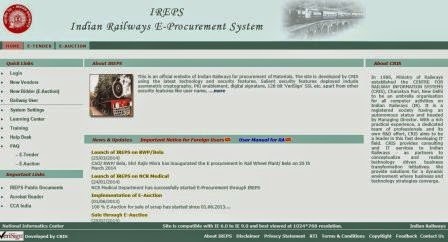 IREPS e-Tender : How to search tenders through Advance Search on IREPS? Click on the E-Tender tab to open the E-tender home page. Click on the Advance Search link available on this page to open the advance search page. Search Criteria: Select the search criteria from the drop down box it could be Tender Number, Tender Title, PLNO (Item Code) or Item Description, if you know the exact word/number which you want to search, select Equals from next dropdown box otherwise select Starting with. Search for: Enter the text which you want to search in the box 'search for', please note that this is case sensitive so if you want to search 'bolt' then write it in the box it will search only bolt with given criteria and it will not search BOLT, Bolt, boLt etc. Railway Zone: select the railway zone if you know that that tender belongs to that particular zone or if you want to search the tenders from that particular railway/zone. Now click on the show result button to see the search result. Department: Select the department of the selected railway zone by default it will be searched for all departments. Bidding System: Users can select the Single or Double Bid System from drop down box by default it will search for both. 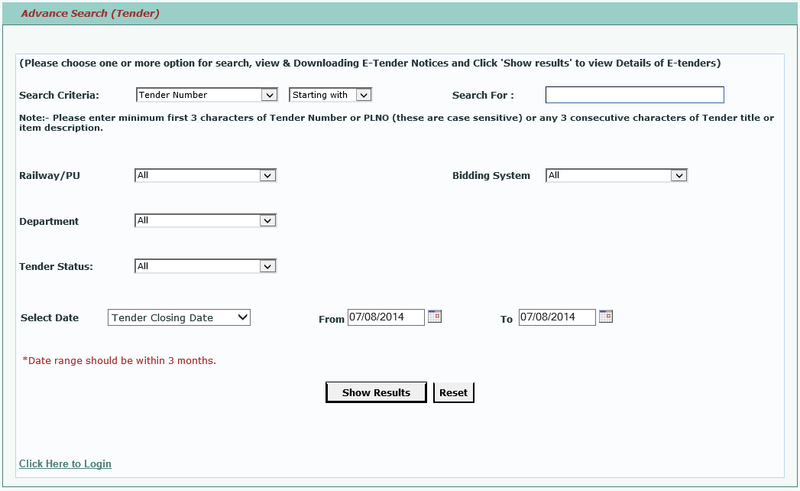 Select Date: Select Tender Uploading Date from drop-down if you want to search the tenders uploaded between the dates selected by you and select Tender Closing Date if you want to search the tenders having a closing date between the dates selected by you. Now click on the show result button to see the search result. Click on the tender number to download the Tender Document (To see/view the Tender Document Adobe Reader should be installed on users system and pop-up blocker should be turned off in browser settings, for more details please click here.). Registered Users: Registered users can search the tenders through the Advance Search link available in the left navigation block on logged in user's home page. 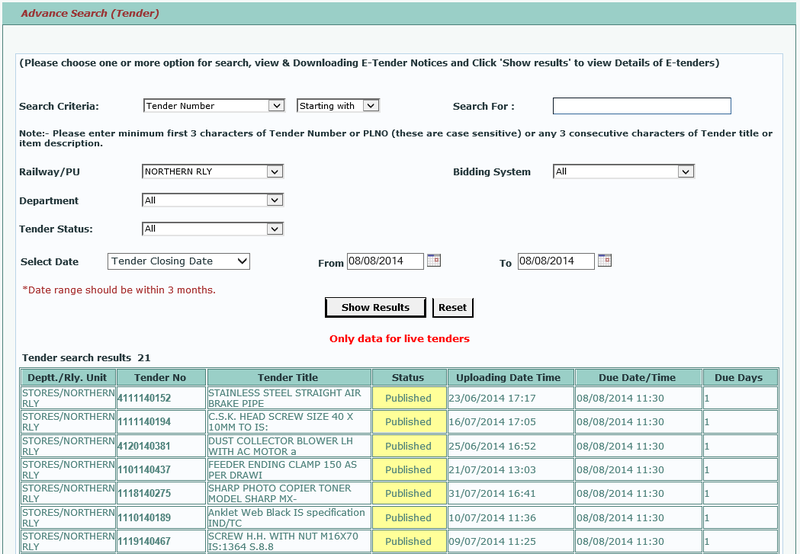 Registered users can search all tenders which may be published, opened, dropped, PO placed etc. Action icons will come on the basis of tender type, tender status, user type etc, i.e. 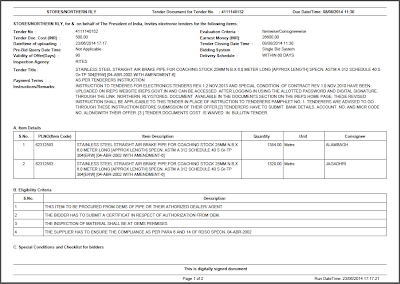 registered users may get different action icons for different tenders and it is also possible that users may get different action icons for the same tender at the different time (tender status becomes changed now). 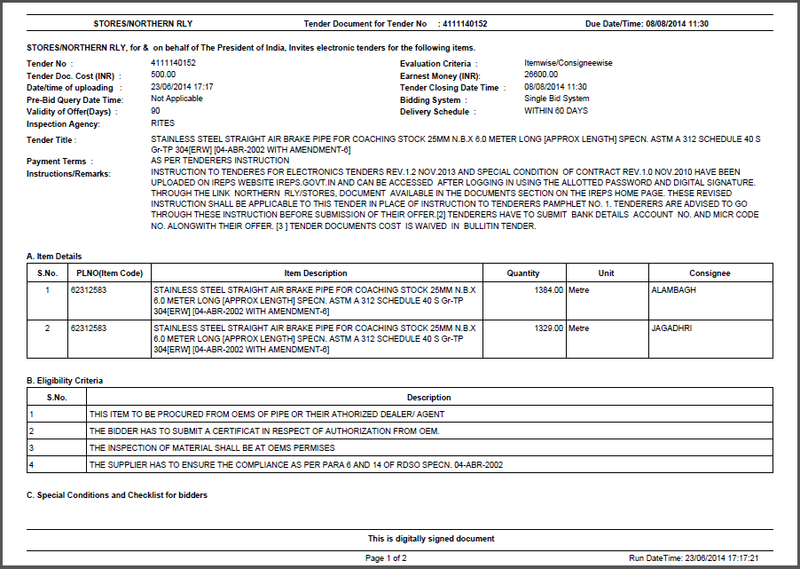 Note: If you do not know anything about the tender then just select the Railway Zone and date range to search the tenders. It will show you all live tenders of that particular Railway Zone. Want to know your current pnr status check it online that's the simplest way to understand irctc pnr status by means of sms or even you can find that as a result of on the internet. currently the services to acquire irctc pnr status with passenger name using simple measures.PNR number means passanger name record number PNR Rank will be Booking Rank of one's coach tickets. Look at your current PNR Status Online, Get into your own 10 digit PNR number with regard to latest pnr rank. Visit us to confirm PNR position involving Indian native. Pay a visit to our own site http://chkpnr.in/. in check out PNR status of Native american Railways tickets. This can be finest PNR standing enquiry web page getting IRCTC pnr reputation. How can i supply garbage bags in railways?